This oiled bronze mirror frame is an excellent choice for framing home decor items, art posters, and beveled mirrors that fit in a warm interior design setting. 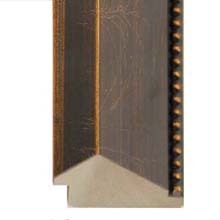 The wood profile is 2 ½” wide, and features a wide bevel along the inner lip that ascends to a ridge, and descends to a beaded outer edge. The finish features coppery highlights under a chocolate brown aging wash, with “veins of gold” throughout the otherwise smooth beveled surfaces. Matting colors to consider with this oiled bronze mirror frame include Tater 9618, Sand Trap 9513, Wet Sand 9515, and Brown Sugar 9586, along with Fresh Brew 9590, Black-N-Blue 9887, and York 9861. Interior design styles that this frame complements include French and Country.